MMS OCTOBER 2018 84 mmsonline.com CREEP-FEED GRINDING grinding depth combined with a slow traverse rate, generally with a profiled grinding wheel, to generate a given geometric form at a material removal rate (MRR) that is much higher than the finishing passes for which grinding is gener- ally known. The MRR is why creep-feed grinding offers such promise. In machining a hard, high- temperature alloy such as Inconel or an even harder material such as a ceramic-matrix composite, the potential MRR of a heavier metal cutting process such as milling is limited. Greater use of these hard materials therefore means greater challenges for milling. 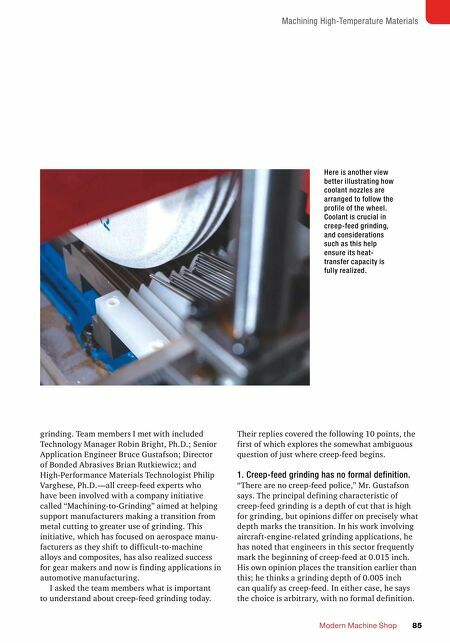 But developments such as grinding wheel improvements have enabled creep-feed grinding's MRR in these same materials to significantly increase. 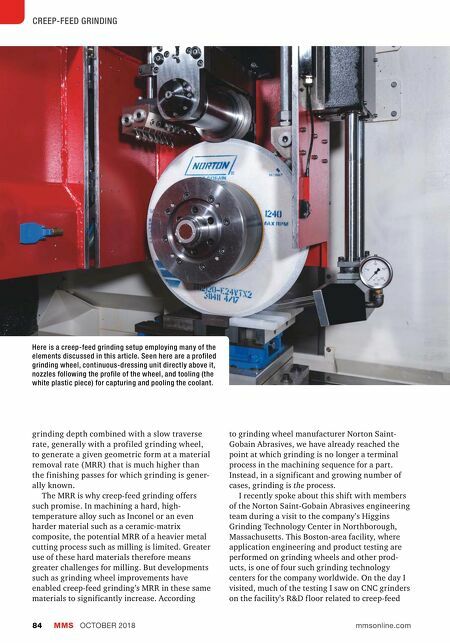 According to grinding wheel manufacturer Norton Saint- Gobain Abrasives, we have already reached the point at which grinding is no longer a terminal process in the machining sequence for a part. Instead, in a significant and growing number of cases, grinding is the process. I recently spoke about this shift with members of the Norton Saint-Gobain Abrasives engineering team during a visit to the company's Higgins Grinding Technology Center in Northborough, Massachusetts. This Boston-area facility, where application engineering and product testing are performed on grinding wheels and other prod- ucts, is one of four such grinding technology centers for the company worldwide. On the day I visited, much of the testing I saw on CNC grinders on the facility's R&D f loor related to creep-feed Here is a creep-feed grinding setup employing many of the elements discussed in this article. Seen here are a profiled grinding wheel, continuous-dressing unit directly above it, nozzles following the profile of the wheel, and tooling (the white plastic piece) for capturing and pooling the coolant.